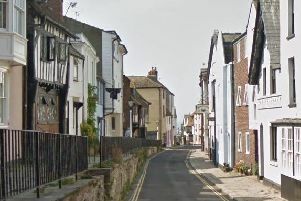 Paul Robey (aged 47), of Old Church Road, St Leonards, pleaded guilty to stealing three joints of beef worth £30.55 from Jempsons supermarket at Rye on June 14. He was given a one year conditional discharge. Christy Vaughan (aged 21), of Virgins Lane, Battle, pleaded guilty to driving a vehicle on St Helens Road, Hastings, on April 16 with cannabis in his blood stream. He also pleaded guilty to possessing a quantity of cannabis resin on the same date. He was fined £275 and banned from driving for one year. He was given a one year conditional discharge for the cannabis possession offence. Brandon Miah (aged 18), of Norfolk Drive, St Leonards, was found guilty of assault by beating. The offence took place at St Leonards on November 11 last year. The court made a community order with a requirement of 180 hours of unpaid work and ordered him to pay £500 in court costs. He was also ordered to pay £200 compensation. Jodie Fisher (aged 25), of Thomas Brassey Close, St Leonards, pleaded guilty to stealing three packs of meat worth £18.93, from Aldi in Hastings on May 16. She also pleaded guilty to stealing three packets of cheese and three packs of meat, on unknown value, from Tesco at Hastings, on the same date. She was fined £25. Lynsey Stevens (aged 28), of Parker Road, Hastings, pleaded guilty to driving a BMW on The Ridge, at Hastings, on March 12 this year, without due care and attention. She was fined £300 and banned from driving for six months. Kevin Cheesewright (aged 48), of Westville Road, St Leonards, pleaded guilty to three charges of being in breach of a restraining order. The court heard that the order was breached when he sent flowers and a card on two dates in February and attended an address on March 1 when the order prohibited him from doing so. He was sentenced to 12 weeks in prison, suspended for one year. The court also made a community order. Andrew Large (aged 47), of Eversley Road, St Leonards, pleaded guilty to dishonestly failing to notify the Department of Work and Pensions of a change in circumstances which would affect Job Seekers Allowance payments. He also pleaded guilty to failing to notify Hastings Borough Council of a change in circumstances which would affect housing allowance. He pleaded guilty to a further charge of dishonestly failing to notify the Department of Work and Pensions of a change in circumstances which would affect entitlement to Employment and Support Allowance. The offences took place between June 2012 and April 2014. The court made a community order with a requirement of 150 hours of unpaid work. Rajesh Kumar Pall (aged 42), of Bowrey Place, Bexhill, was found guilty of fraud in that he made false representation of himself as an internet sales person supplying good but not intending to supply anything to make himself a gain of £1,500. The offence took place on September 3 last year. He was sent to prison for 12 weeks, suspended for one year. The court also ordered him to pay £1,500 in compensation and £620 prosecution costs. Nathan Sinden (aged 31), of Ivyhouse Lane, Hastings, pleaded guilty to two charges of assaulting a woman by beating her. The offences took place at Hastings on March 29 and April 9. He pleaded guilty to a further charge of damaging two windows on April 9 and damaging a mobile phone worth £300 on March 29. He was sentenced to twenty weeks in prison, suspended for two years. Magistrates said the reason for the sentence was repeated offences of domestic violence, aggravated by threats with a knife and previous convictions. The court also made a community order with a requirement of 150 hours of unpaid work and that he should attend a domestic abuse perpetrators programme. He was ordered to pay £160 compensation and the court made a restraining order. Lee Hersey (aged 36), of Priory Road, Hastings, was found guilty of being in possession of a knife in a public place, at St Georges Road, Hastings, on October 31 last year. He also pleaded guilty to stealing six joints of meat, worth £39.23, from Aldi, in Hastings, on April 24 and to stealing meat steaks and washing liquid worth £70 from Co-op, in Hastings, on February 28. He pleaded guilty to handling stolen goods on October 10 last year and to being in breach of a one year conditional discharge, imposed by an earlier court for possession of cocaine. He was committed to Lewes Crown Court for sentencing. Robin Green (aged 30), of Magdalen Road, St Leonards, pleaded guilty to dishonestly receiving stolen wooden gates worth £2,126.40, The offence took place at Bexhill between December 30 last year and January 2. He was given a 12 month conditional discharge. Sarah Leah (aged 40), of Greeba Court, St Leonards, pleaded guilty to assaulting a police officer. The offence took place at Marina, St Leonards, on June 16. She also admitted being in breach of an eight week suspended prison sentence, made by magistrates on April 20, for offences of assault by beating and shoplifting. She was sent to prison for a total of nine weeks. Ricky Sawyer (aged 24), of Paynton Road, Bexhill, pleaded guilty to being in possession of cannabis at Bexhill on June 18. He was given a 12 month conditional discharge.